In my years as an engineer working in the defense industry, I had to regularly deal with many levels of security and comply with a multitude of security requirements. Today, I am prudent and reasonably confident and comfortable with my everyday personal computer security. Recently I added a password manager application to my personal computer and mobile devices but suspected I may not be using this application to its fullest capability. 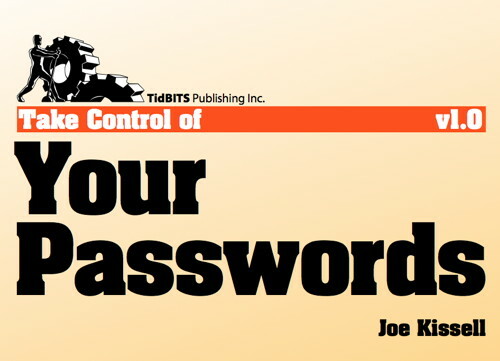 When I was given the opportunity to review Joe Kissell’s Take Control of Your Passwords, I jumped at it. This 88 page ebook, is filled with details about password security and what everyone needs to know about securely using their personal computers and mobile devices. The use of a password manager application is a main subject covered in this ebook. Beginning with the the first chapter, I learned, like I am sure many of us are equally guilty of, just how really poor and weak many of my passwords were. Joe KIssell asks if you are using the same password at more than one location. If you do, correct that right now! How about your username? Is your email address your user name? Do you know how to select the correct answers to those security questions you are required to answer in case you can’t remember your password? These are just some of the many important security issues addressed in this must-have ebook. Taking Control of Your Passwords enlightened me on the security threats everyone faces with our personal computers and mobile devices. The growth in computer technology, still following and exceeding Moore’s Law, provides the criminal element the capability to quickly steal or crack your weak passwords, access your personal information, and drain financial accounts. If increased criminal technology doesn’t get one’s attention, one still has to worry about all of the social engineering tricks that are used to hack into your computer and financial accounts. The bottom line, the security techniques that worked well in the past, are now simply outdated. Joe Kissell did a very nice job of guiding me through some complex cryptographic material in a skillful, easy to read, and understandable manner. For example, he explains the use of entropy in developing a strong password. How does entropy relate to password strength, password length, characters used, and randomness? Taking Control of Your Passwords covers how you can develop a strong password and still have it be memorizable. The author provides many useful tips to assist developing passwords and password management strategies. Do you know what a VIP list is relative to password security? I didn’t, but I do now, and I’m using it! Before I even finished reading Take Control of Your Passwords, I began implementing much of what I learned to fix my personal computer security. I am also making far more use of the capabilities my password management application provides. Kissell covers a good selection of password manager applications that are available, including the one I am currently using. He points out that not all password managers are perfect but some have features that may better fit the reader’s needs than others do. Password managers addressed in Take Control of Your Passwords include; 1Password, Data Vault Password Manager, eWallet, Keeper, LastPass, mSecure, RoboForm, and SplashID. Joe does a nice job of covering the pros and cons of each of these password managers. We also need to keep our passwords secure, especially when using them in wireless networks. Take Control of Your Passwords goes into a good amount of detail addressing the security problems associated with public and private wireless networks, and he provides many straightforward solutions. Are you using the right encryption on your private Wi-Fi system? What about your email? Do you use public Wi-Fi? Do you have a backup plan that includes your password? Questions like these and more are nicely addressed in this ebook. For myself, after reading Taking Control of Your Passwords, fixing the problems I uncovered with my passwords and security is like trying to eat an elephant. I know it can be done, a forkful at a time, but with a lot of time. The good news is, Joe Kissell gives some real helpful tips on just how to approach this huge, but important task. Take Control of Your Passwords is a must-have in your library. The book is available in PDF, EPUB and Mobi format. It is well-written, straightforward, and loaded with easy to understand security requirements, and the answers to what you should do with your personal computer and mobile device security. I am awarding Take Control of Your Passwords a rare perfect MyMac.com Review Rating: 10 out of 10.